Photo: Midway Plantation, ca, 1859, U.S. Route 601. Fort Motte, SC. Listed on the National Register of Historic Places in 1976. Photographed by User:Bill Fitzpatrick (own work), 2012, [cc-by-3.0 (creativecommons.org/licenses/by/3.0)], via Wikimedia Commons, accessed October, 2015. Calhoun County administrative offices are located in the Courthouse Annex, 102 Courthouse Drive, St. Matthews, SC 29135; phone: 803-874-2435. Beautiful Calhoun County  is located on the outskirts of South Carolina's capital city; the county seat is located in St. Matthews. A rural and pastoral region of the state, Calhoun County is a popular destination for some of the nation's leading industries, particularly locomotive and logistic companies who need convenient access to interstates. 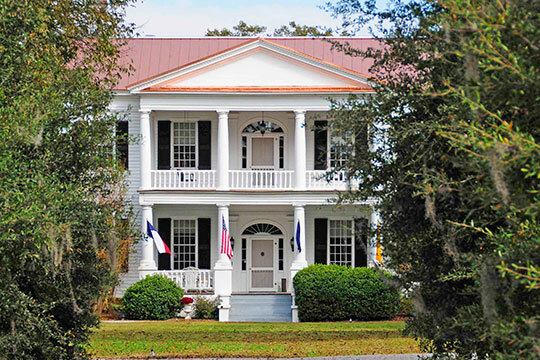 A short half hour drive to Columbia and an hour and half drive to historic Charleston, Calhoun County is an ideal place for those who enjoy a quiet and friendly community close to urban cities. Calhoun County is about blue skies and mild weather and is home to a little over 15,000 residents. St. Matthews is the County Seat of Calhoun County and was established in 1908. We are only 35 minutes from the State Capitol (Columbia) and a little over an hour from the Port City of Charleston. Calhoun County South Carolina Parks & Recreation Department, 2014-2017 Recreation Master Plan, www.calhouncounty.sc.gov, accessed October, 2015.